My approach to working with clients is a unique system that facilitates deep healing and spiritual transformation ~ finding and healing the hidden roots of challenges through going beyond conventional methods. Not only is this approach a healing method, it is a powerful system for facilitating growth, guiding clients to become conscious co-creators of the life, relationships and work in the world that expresses their highest and best Self ~ the person and work each person is uniquely born into this lifetime to become. I term this deep holistic approach “The Sophia Method™.” Because this approach is distinctive and many have questions about what it is and how it works, the following is a basic introduction. The links to the right will take you to further information. This discussion is not reductionist or mechanistic. The Sophia Method™ is more than the sum of these elements, and ultimately taps into and accesses the mystery and magic of being Human, and the mystery, magic and wonder of life itself, as I guide women deep into their Being, to find answers and healing for the purpose of their pain and challenges, as well as their gifts and callings, and how all of this is exquisitely a part of each woman’s beautiful Heroine’s Journey. PSYCHOTHERAPY AND COACHING: Two Differing Approaches to Helping People Change Their Lives. Psychotherapy is the mainstream broad umbrella for helping people with their personal or relationship concerns. While there are many schools and approaches to psychotherapy, they have common underpinnings and assumptions about people and how people change. While acknowledging that there is a range of emphasis in each of these characteristics, in general psychotherapy today has the following underlying premises. Some of these will be familiar, some not, some premises will be comfortable for you, others not. Coaching is the newer approach to helping people change and achieve their desires. This is contrasted to psychotherapy below. The emphasis is on self-awareness and insight, with an inward focus. Change is inferred in the increase in self-awareness and insight. More traditional or old-school models are based on a paradigm of pathology, in other words, a paradigm of brokenness. They diagnose and treat mental disorders, as categorized in the Diagnostic and Statistical Manual of Mental Disorders, the mental health equivalent of the medical diagnostic manual. The relationship between therapist and patient is hierarchical. The therapist is the expert, the client is a patient. This is inherently paternalistic and keeps patients in a position of less personal power. The medical model is central. Human Beings is a set of components, some of which need to be fixed, with little if any recognition of the whole person. Individual methods of psychotherapy tend to de-emphasize the person in the context of her relationships, and the influence that relationships and families have on individual health and functioning. Newer methods of psychotherapy are more solution-focused and brief. This is a result of the impact of managed health care to achieve changes in behavior as quickly as possible, as well as an approach to answering the question of “why?”. The primary focus of change is external, with some work to change feelings, thus the term “behavioral health”. Still anchored in the medical model. The paradigm is one of finding solutions. There is some moving away from the paradigm of pathology, though newer methods still diagnose and treat mental disorders. Less hierarchy in the relationship between therapist and client. The client is now in a more equal position relative to the therapist. Language is the primary tool. Works with the mental, emotional, behavioral and relationship levels of the client(s). Marriage and Family Therapy is among these newer models. Focus is on the whole person in the context of her relationships and on her life story and her life journey. Paradigm is one of wholeness and potential, empowering a client to live a more empowered, fulfilled and self-actualized life. Coaching is focused on quality of life. The orientation is toward the future, and the outcomes clients wants to create, and includes movement from inner to outer worlds. The past is discovered and addressed as part of this orientation and movement. Clients are seen as powerful, whole, capable and self-determining. This lens is profoundly empowering for clients. The relationship is seen as a partnership of equals. The coach is a co-creator and guide. Grounded in the Human Potential movement, coaching is not limited by the medical model or managed care. Coaching does not diagnose or treat mental disorders. While I began my career as a Marriage and Family Therapist and retain much of this framework and basic guiding principles, The Sophia Method™ is aligned with the coaching model of change. I do not diagnose or treat mental disorders. Clients are powerful, Self-determined and whole with enormous potential for growth. We focus on the future and creating her highest quality, optimal, ideal life, marriage and highest contribution though her unique gifts and life experiences. We include understanding her past, and discovering it’s meaning and significance in her life, and access this rich source of healing and empowerment as the means of healing the hidden roots for the challenges she wants to move beyond. We work together as a team from an inside – out paradigm to create the new foundation for the deepened love, fulfillment, joy and contributions she Desires to create. Energy Psychology (EP) is not psychotherapy as traditionally understood or described above. It is “a mind-body approach to understanding and improving human functioning. EP focuses on the relationship between bio-energy systems, neuro- and electro- physiological processes, and mental functions involving thoughts, emotions, sensations, and behavior. These systems and processes exist and interact within the individual and between people. They are also influenced by cultural and environmental factors. Within an EP framework, emotional and physical issues are reflected in bio-energetic patterns within and around the mind-body-energy system. Since the mind and body are thought to be interwoven and interactive, this mind-body-energy system involves complex communication involving neuro-biological processes, innate electro-physiology, psycho-neuroimmunology (PNI), consciousness, and cognitive-behavioral-emotional patterns. What this means is that Energy Psychology comprises an innovative family of approaches that build on our understanding of body/mind psychology and utilizes various aspects of the human energy system. This system includes the bio-field that envelops the body, the energy centers, and the energy pathways. Positioned on the shared frontier of psychology, biophysics, and spirituality, Energy Psychology techniques show remarkable effects in treating and alleviating physical, emotional, relationship and spiritual distress. These include the relief of trauma, phobias, anxiety, stress, addictions, compulsions, allergies, personality concerns, long-standing relationships problems and learning disorders, to name a few. Energy Psychology tools are also effective in promoting high level health and peak performance on the physical, mental, and creative levels. Often within minutes of using Energy Psychology tools, physical or emotional symptoms are greatly reduced or no longer present. “Over 100 research studies, review articles and meta-analyses of Energy Psychology have been published in professional, peer-reviewed journals.” The evidence base for EP is growing rapidly in both quantity and methodological rigor. From the results through 2018, we can say that “multiple research studies have found that Energy Psychology methods effectively treat: depression, anxiety, food cravings, pain, trauma and PTSD. In addition, some studies have shown clinically beneficial shifts in stress chemicals and gene expression… In 2016, Thought Field Therapy, (TFT) a method of Energy Psychology, was validated by NREPP (the National Repertory of Evidence Based Practices and Procedures, a division of SAMHSA in the U.S.) as an evidence-based treatment.” Thought Field Therapy is a centerpiece element of The Sophia Method™. Spiritual Life Coaching guides people to change on a deeper level than their conscious beliefs and feelings and their outward lived experiences. The fundamental premises of Spiritual Life Coaching are that clients are spiritual beings having an earthly experience, and that their experiences are not their identity. This is the complementary other hand in partnership with Energy Psychology. Using these together, I guide clients to tap into their connection with the Divine within themselves and Divine Source. 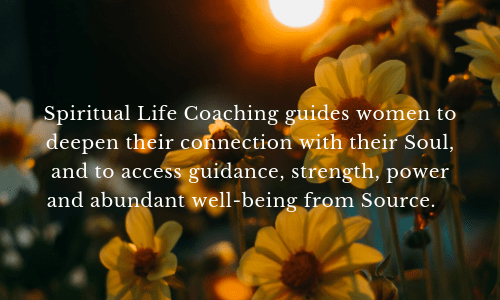 With Spiritual Life Coaching, I also teach clients the Universal Laws of Life and guide them in learning to become the conscious co-creator of the life they want ~ the Soul-satisfying life that creates the most joy, fulfillment and meaning in their lives. To dispel a common misunderstanding, Spiritual Life Coaching is not religion, and does not promote or endorse any specific church or system of dogma or belief. Spiritual Life Coaching guides clients in deepening their direct connection with their Soul, and the non-physical dimension wherein is the Source of Ultimate Being. When we understand ourselves from a spiritual perspective, and learn how to tap into the spiritual dimension, we access guidance, strength and power, and greater meaning in our lives. With the integrated and synthesized holistic combination of Energy Psychology and Spiritual Life Coaching, clients discover their profound purpose, and the meaning and reasons for their unique life paths. Client then are empowered to heal and release the hidden, roots causes of their challenges, and then consciously co-create the life they Desire instead. Sacred Practices empower us to live a conscious, spiritually-grounded life day to day. They guide and empower us to connect with ourselves and the Divine and live our outward lives from this connection and groundedness. The purpose of these practices is to include in our spiritual connection a practical spirituality that is a source of strength, guidance and power, and a pathway to open doors of communication and partnering with Divine Source in the co-creative process. Sacred Practices are essential elements of learning to live from Soul and becoming a conscious co-creator of the life we Desire. We live in an ordered cosmos ~ literally a beautiful order. The beautiful, harmonious whole of the cosmos is governed by physical as well as non-physical laws. Everyone knows the law of gravity and most have at least an introductory awareness of the laws of thermodynamics. Many have forgotten or never consciously studied or considered the non-physical Laws of The Universe and what they imply, yet these laws are where the process of creating the beautiful harmonious whole of the Universe as well as our own lives and relationships, and our experiences in life, begins. Those women who in this lifetime are on a Heroine’s Journey, are also in a lifetime of gaining Mastery. This Mastery includes at its heart regaining your knowledge of yourSelf and your immense potential and power of creation. Whatever else your Heroine’s Journey includes, it always includes this. Relearning is really a process of remembering, because in a dimension before this lifetime you knew this, and you knew the Universal Laws ~ on a Soul Level, you still do. Mastery includes remembering them in this lifetime and learning to consciously work with them in such as way that you become a conscious co-creator in the physical world. You cannot gain Mastery without being physically embodied. We need access to the “stuff” of creation ~ the physical world of the third dimension ~ in order to gain our Mastery. 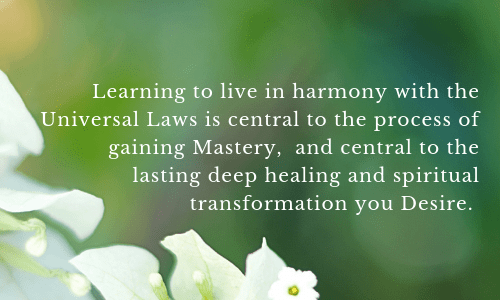 Learning to live in harmony with the Universal Laws is central to this process and meta-purpose of our Heroine’s Journey. And when we do, our lives start to flow and work so much more easily! Living in harmony with the Universal Laws in combination with Energy Psychology and Spiritual Life Coaching is how we learn to step off the roller-coaster of repeating the same issues and challenges over and over, and substantively transform our lives and relationships into what we most deeply Desire. Just as the cosmos is a beautiful, ordered whole, so are we. In fact, sages and mystics throughout time have taught that human beings are a reflection of the cosmos, a microcosmic mirror of the macrocosmic universe. Just as the cosmos has energetic and physical elements, so do we. While modern psychotherapy and coaching almost exclusively focus on mental and emotional aspects and how they impact relationships and “behavioral health”, the more complete paradigm recognizes and uses this ancient understanding of the whole person. The term “holistic” comes from this idea, that human beings are more than a body and mind, and that we have a spirit aspect to our being. A holistic approach to life, healing and growth is founded on this principle. While contemporary living largely focuses on the outward body and physical and mental well-being, the ancients understood that as whole beings, we are whole, integrated systems, and that optimal well-being comes through balance, integration, and recognition of the need to care for, nurture and listen to all levels or aspects of who we are. Etheric Level: The energetic bio-field that is closest to the physical body and includes the flow of subtle energy through the physical body. Mental Level: The thoughts we consciously think, and the level of the unconscious beliefs we take on in our families, through generational and cultural patterning, and that we conclude through life experiences. Most of this level is beyond our conscious awareness. Emotional Level: The level of our feelings, which is energy in motion. The relationship between thoughts and feelings is well known and it is well documented that we can change our feelings by changing our thoughts. Yet emotions have a deeper level, meaning and power, and when we approach them in this deeper way, we gain greater healing. Intuitive Level: The interface between the emotional and the spiritual levels. Many energetic attachments have their invisible roots at this level. This level of being and healing and the two that follow take us beyond the paradigm of conventional approaches to growth and healing. Spiritual Level: The level of connection with trans-personal energy. This level pertains to this life and has to do with your connection with Source. Soul Level: The level of Essence, your most Essential Self. This level includes that part of You that goes forward from lifetime to lifetime. Because the higher the level, the higher the vibration, accessing and working at the higher levels to find where the invisible origin of someone’s problems is anchored is crucial to deeper, more lasting healing and growth. This is also how we create the new energetic foundation for a client’s heart’s Desires. This is in harmony with the creation pattern that all life in the cosmos follows. We create at the spiritual and energetic levels first, and then bring it down through successive levels to the manifest, physical world. We are Eternal Beings on an eternal journey of growth along the great arc of the transmigration of the Soul. And as holistic, whole person beings, this is both an eternal, innate drive and an innately integrated process. We are born with both the drive and the capacity for growth. It is who we are, and essential to the process and purpose of life. This central premise of Dr. Sue Johnson’s Emotionally Focused Couples Therapy has led to the most researched and most highly successful mainstream relationship therapy method in modern use. That is because relationships at heart are about the bonds between people. We are in our deepest sense, relational beings. We seek and need secure connection from earliest life in the womb.8 This continues throughout our lives. The security of our attachments with those we love are huge factors in our well-being and success in every other area of life. This is also why injuries to our attachments with those we love are deep wounds to heal. Though I only intuitively sensed it at the time I began graduate school, this key insight is at the very central heart of our happiness as fulfilled humans. It is also enduringly at the very heart of my own emotionally focused approach with The Sophia Method™. WHAT GETS IN THE WAY OF LIFELONG GROWTH, TRANSFORMATION, AND LIVING AN OPTIMALLY SELF-EXPRESSED LIFE? If we are eternal Beings on a Journey of continual growth and expansion, what gets in the way for so many of us on this Journey? Why do some get stopped, or blocked or don’t believe it is possible for them? Why do some quit or become complacent with their current level and stop moving forward on their Journey? While discussing this question has been the focus of conversation for millennia, aside from variations of natural expression or biological conditions, or an individual’s Soul agreements for this lifetime, I think there is one answer that more than any other, causes people to get stopped or blocked or stop believing healing or growth or what they deeply Desire is possible for them. Trauma is more than just challenges or obstacles or set – backs. Trauma happens whenever the body-mind perceives being in a situation of danger; this can be life-threatening or not. This is an intentionally broad definition, and includes directly experiencing this danger, or witnessing it. Trauma include experiences such as natural or human-caused disasters, war, child abuse or violence, as well as emotional or psychological danger, such as loss of a parent or loved one through death or divorce. It can include the loss of a pet or moving. Anything that is experienced as a situation of danger or loss of safety or security can be experienced as trauma. When these kinds of experiences happen, the fight/flight/freeze stress response kicks in and the body is mobilized to get into action – QUICKLY – for safety’s sake. Pulse, breathing rate and blood pressure increase. Blood flow shifts from cerebral cortex to limbic brain. Blood flow shifts from internal organs to arms and legs. Muscles tense and prepare for action. Digestive, immune and reproductive systems slow down. What happens mentally is that the event/experience and your immediate emotional reactions and unconscious beliefs get isolated and “frozen” in a packet so to speak on a neural pathway. This is also part of the safety/survival mechanism to help you protect yourself and get to safety as quickly as possible. These become frozen mental-emotional memories on a neural pathway to be processed and released later. However, when they are not, people become hyper-sensitized, and easily triggered by new events that somehow feel and seem the same. This is in combination with new traumatic events that are stored on neural pathways, and if they are similar in nature, they are stored in layers on the same neural pathway. The more memories that are encoded and stored, the more sensitive and easily triggered a person becomes. Releasing the unhealed traumas in our lives is crucial to not only being freed from present-day inner tyranny of traumatic memories, it’s crucial to being freed from the blockages and obstacles that impede moving forward on our own Soul Journeys in optimal growth, Self-expression, love, connection and contribution. And it is crucial to freeing our children and grandchildren from the tyranny of generational trauma. The great questions of antiquity are still the most powerful and empowering questions for deep healing and spiritual transformation today. These are the questions asked and answers taught in all the Mystery Schools of the ancient world. They are the great questions because in asking and seeking the answers, the initiate steps consciously onto the path of their Soul Journey in this lifetime, and consciously onto the path of awakening. The questions, beyond the first, and the discovery of the answers to all of them, were carefully guarded because these answers have profound power to transform and elevate the initiate into their greatest potential, and it was understood that an initiate had to be prepared and ready for the Journey. The deepest injury of the impact of trauma is how it disconnects us from ourselves, in our earthly life; from our bodies, from our sense of continuity and connection with others, including our families, from our memories in general, in the attempt to shut out painful ones, and from our experience of ourselves in a larger sense. Trauma disconnects us from being ready to start the initiate’s Journey, and therefore, going deeper into discovering the truth of ourSelves. Trauma interferes with our awakening to our True Selves. Well, I’m a spiritual seeker; if you’ve read this far, I think you are too. Through over 30 years of professional experience and my own life journey, I’ve sought the answers to these Great Questions, and guided clients to do the same, beginning with the first one. Along the way, I’ve come to see that the stopping and healing of trauma is the central need and zeitgeist of our age. Healing trauma is also central to deep healing and spiritual transformation. It’s been my life’s work and a spiritual quest to discover this for myself and for those whom I am privileged to serve, and to bring together and synthesize this body of knowledge, healing methodologies and creation principles with timeless wisdom and esoteric truth. All of us have trauma in our previous generations, if not in our own present lifetimes. It is time for all the vast burden of traumatic imprint on humanity to be released. I can say through the experience of these 30 years of guiding clients on their Journeys, and through my own experience as well, that trauma can be overcome. When released from trauma, the Soul is freed to move forward on her Soul Journey, freed to flourish, to love deeply and fully, and to contribute her unique gifts that only She can give. The Sophia Method™ is the gift that I am privileged to offer as the means to do it, to guide women to the deep healing and spiritual transformation they are seeking and deeply Desire. Excerpted from “What is Energy Psychology?” The Association for Energy Psychology. Excerpted from “The Science Behind Energy Psychology: Quick Facts.” The Association for Energy Psychology. Based on the holistic work of Dietrich Klinghardt, MD, PhD, a practitioner of neural therapy. Developmental theorists who have mapped growth and development include: Jean Piaget, Swiss psychologist who developed the theory of cognitive development. Alfred Adler was an Austrian medical doctor and psychotherapist who broke from Freud and developed a whole person theory of personality. He was one of the first to recognize the importance of the human social context, and an early predecessor to Family Therapy. Abraham Maslow, an American psychologist, developed a famous hierarchy of needs that pertains to emotional growth and happiness. He was one of the first to study human potential and motivation. Eric Erickson was a German-American developmental psychologist and psychoanalyst. His stages of psycho-social development cross the human lifespan from infancy to old age. Laurence Kohlberg developed a model of psycho-social development based on the work or Piaget, that focused on moral development. His theory states that moral development is based on a person’s stage of cognitive development. Most recently James Fowler, associate of Laurence Kohlberg, was a professor of Human Development and Theology, and developed a theory of faith development, meaning the way a person makes sense of life. His theory sees faith development as potentially spanning the life span, though many people stop their “quest for meaning” prior to reaching the last stage, similar to Erickson and Maslow. Kerr, Michael E. “One Family’s Story: A Primer on Bowen Theory.” The Bowen Center for the Study of the Family. Alejandra Caqueo-Urízar, Mar Rus-Calafell, Alfonso Urzúa, Jorge Escudero, and José Gutiérrez-Maldonado “The Role of Family Therapy in the Management of Schizophrenia: Challenges and Solutions.” Neuro-psychiatric Disease and Treatment. 2015: 11: 145-151. Johnson, Sue. Hold Me Tight: Seven Conversations for a Lifetime of Love. 2008. Pg. 5-6. Little Brown and Co.
See for example, Thomas Verny, MD, John Kelly. The Secret Life of the Unborn Child: How You Can Prepare Your Baby for a Happy, Healthy Life. 1981. Dell. This was one of the first to describe for lay readers the influence of the emotional life of the mother on an unborn child. Yousseff, Nagy A., Lockwood, Laura, Shaoyong Su, Guang Hao, and Bart P. F. Rutten. “The Effects of Trauma, With or Without PTSD, on the Transgenerational DNA Methylation Alterations in Human Offspring.” Brain Sciences 2018 May; 8(5): 83. Countless sources teach about the stress response and trauma. One of the best I know of that teach about the way traumatic memories are encoded and re-triggered on the neural pathways is in Rapid Eye Technology training materials. The Rapid Eye Institute. Salem OR. Bassell Van Der Kolk, MD, The Body Keeps the Score: Brain, Mind and Body in the Healing of Trauma. Random House. 2014.